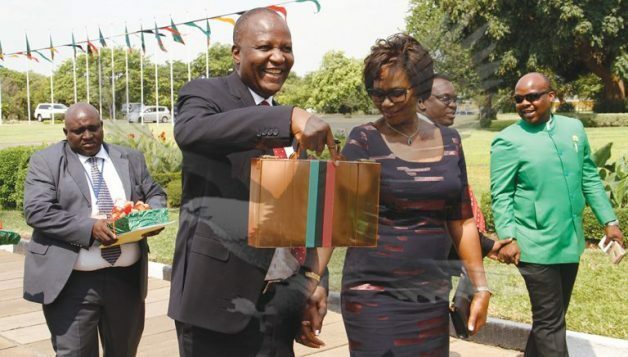 Finance Minister Felix Mutati has unveiled the 2018 national budget proposing to spend K71.6 billion or 25.9% of GDP. In his Budget speech to Parliament, Mr Mutati said of this amount,K49 billion or 68.5 percent of the total budget will be financed by domestic revenues and K2.4 billion or 3.4 percent by grants from various co-operating partners. He says the balance of K20.1 billion or 28.1 percent of the budget will be financed through domestic and external borrowing. Mr Mutati says in line with the Seventh National Development Plan, the allocations in the budget are targeted at addressing the five strategic areas of economic diversification and job creation, poverty and vulnerability reduction, reducing developmental inequalities, enhancing human development and creating a conducive governance environment for a diversified and inclusive economy. He has proposed to spend K25.9 billion on General Public Services with K7.3 billion and K7 billion going towards external and domestic debt payments, respectively. Mr Mutati says in the same vein, he has allocated to the Constituency Development Fund a total of K218.4 million to support projects at the community level. He has also allocated K2.1 billion towards the maintenance of public order and safety. He says key interventions will include the recruitment of security personnel, continued rehabilitation and construction of infrastructure and the modernisation of operations of law enforcement agencies. And Mr Mutati has proposed to spend I propose to spend K11.6 billion on education and skills development. He says this will facilitate spending on, among others, infrastructure development, student loans, teacher recruitment and procurement of school requisites. Mr. Mutati has also proposed to spend K6.8 billion on health of which K1.2 billion is for procurement of essential drugs and medical supplies representing a 56 percent increase over the 2017 allocation. He says the balance will be used to finance health infrastructure, medical equipment and staff costs including the including the recruitment of medical personnel. The Minister has also proposed to discontinue the 5-year income tax holidays that is facilitated through the Zambia Development Agency. He says in place of the tax holiday, he proposes to grant accelerated depreciation for capital expenditures by qualifying investments in priority sectors. He has also proposed to introduce an excise duty of K2 per 50 Kg bag of cement. Mr Mutati has further proposed to increase TV levy to K5 from the current K3. He has also proposed to Introduce a landing rights charge at the rate of K3, 150 per television channel which has less than 35 percent local content except for educational and scientific channels. Mr Mutati has also proposed to introduce property transfer tax at 5 percent on the transfer of intellectual property – Qfm.